“Raheam Felton, 31, of Southwest Philadelphia, was charged with murder and possession of an instrument of crime in the killing of London Banks, reports the Philadelphia Inquirer. . . .
Felton was identified by witnesses and taken into custody. Police said he admitted to the killing. 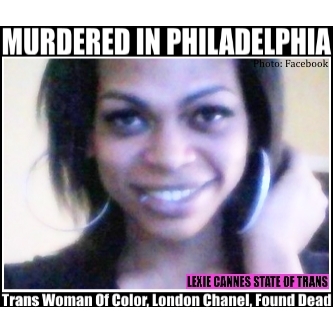 (Original article, May 18, 2015:) While initially misgendered by local media, the Philadelphia’s mayor’s office later confirmed that a person stabbed to death in the city on May 18, 2015 was a trans woman. The victim, London Chanel, (aka Londyn “Kiki” Chanel-Washington, London Banks) was found in outside a vacant North Philadelphia home. UPDATE May 19, 2015. Additional info from the NBC affiliate in Philadelphia: Police Chief Inspector Scott Small said the incident began as an argument between the victim and attacker. Chanel ended up being stabbed 3 times, twice in the back and once on the neck. Witnesses say CPR was started and she was rushed to a hospital by the police. She was later declared dead at the hospital. The attacker has not been arrested at this writing but is being questioned by police. While trans women of color have historically been disproportionately murder victims in the United States, this year has been particularly ugly in that regard. On the upside, recognition of this reality is increasingly being reported on in the media. Sigh. That’s all I can ever say, anymore. I am not young and I am not a woman of color, but I am appalled by this continue outrage against our community! Hate crime legislation to fight hate crimes needs stronger teeth to get the message across that if you murder a transwoman, it’s murder and you will die for your crime in this country. What is it we want to do about it? Awareness is a good thing but what would make it safer for trans women? Taking step to be safe helps. Unbelievable! Trans woman of color CiCi McDonald was immediately arrested then later sentenced to 41 months in prison for defending herself from an attacker…. and yet, the person that attack and stabbed Kiki to death, is only be questioned and not in custody ?!?! Cici or Kiki…. No justice. Yes, double standards shouldn’t be the status quo by the police departments in this country as well as the rest of the world. Rest in peace Kiki.